We are delighted to be able to offer the joys of the nation's favourite Plum 'Victoria', but small enough for EVERY garden! Now anyone can grow juicy, fresh Vics, even on a balcony, terrace or small patio. 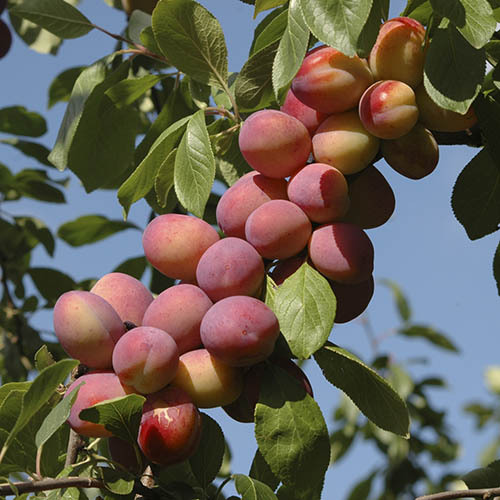 Clever fruit tree grower Will Sibley has teamed the ever-popular best-selling 'Victoria' with a very dwarfing and compact new VVA1 rootstock, which removes most of the vigour that can sometiomes be the downfall of plums. It's like someone has shrunk the tree - smaller in every ways, except the fruit, which is just as big and juicy as the normal variety. It still produces lovely pure white spring blossom displays, and is self-fertile, so no other plums needed for fruit - just leave the bees to do their thing! Perfect in large patio pots (minimum 30cm diameter) for 5 years or so, it produces big, juicy crops of classic red Victoria Plums, yet stays small, manageable and perfect for everyone. Supplied as a grafted patio tree pot grown in 4L pot, shaped and ready to plant out into garden soil or large pots. Perfect in large pots on a patio - 30cm diameter or larger. Water regularly, and don't let the soil dry out if planted in pots. Stone fruit should not be pruned during winter, to minimise the risk of infection - early summer is the ideal time. Established trees don't require radical pruning, just take off any diseased, dying and damaged branches, (the three Ds). Look at the overall shape and aim for an open structure of branches and remove any that cross over so they don't damage each other. Hang wasp traps in trees and harvest crops as soon as they ripen. Avoid leaving windfalls or over-ripe fruit on the ground.